Ultrasonic Soldering is used to join materials without flux to create a metallurgical or mechanical bond. A metallurgical bond is formed when the oxide from the base metal is removed through ultrasonic cavitation and implosion in the solder. The solder then comes in to contact with the base metal and the ionic attraction between the two forms a bond. A tin or lead solder bonded to copper is an example of this. A mechanical bond usually involves no oxide on the base material. The cavitation and implosion in the solder create forces that agitate the materials and form an interlocking mechanical bond. Coating a ceramic with solder is an example of this process. There is no need for flux and therefore, as the solder is acid free, there is little, or no, corrosion and degradation of the soldered joint and substrates over time. A powerful 80W Ultrasonic power output which is powerful enough for most needs is standard on the Solsonic Iron and a powerful 250W Generator on the UM250 Soldering System. Variable heating control from 60°C to 450°C. The Iron has 5 levels of Ultrasonic control. The Ultrasonic energy can also be turned off by the rotary switch incorporated in the iron control panel and can used as a conventional soldering iron. 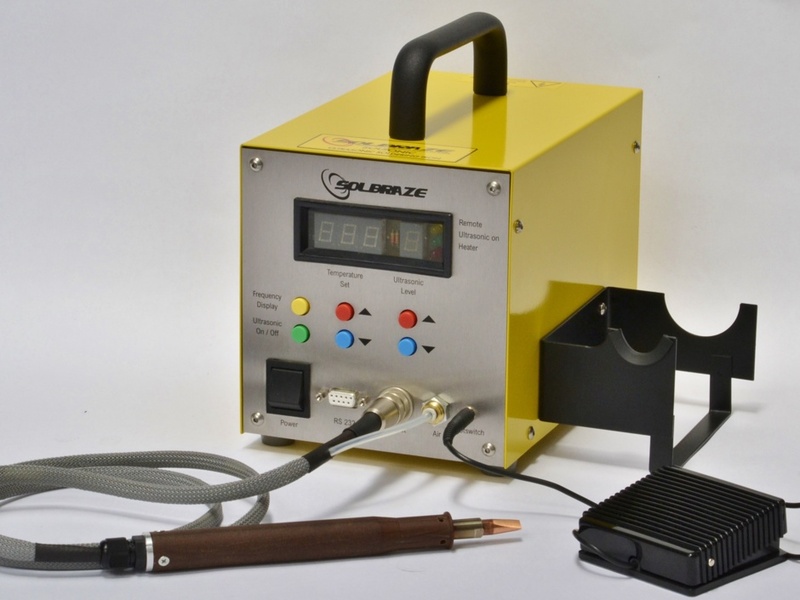 The Solbraze Solsonic Iron and the UM250 Ultrasonic Soldering System give you all the flexibility you need for even the most challenging jobs. As with resistance soldering the beauty of ultrasonic soldering is that previously hard to bond items can be repaired rather than discarded. Applications are wide and varied and the Iron is used by Laboratories and Universities in the UK, Europe and around the world. The Solsonic Iron and UM250 Soldering System create a metallurgical or mechanical reaction that can bond a wide variety of substrates such as ceramics and glass, Solid state Ceramic thick- and thin-film substrates, Flat glass production, Optical glasses, Solar cells, Semiconductors, Liquid crystals, Superconductors and Hermetic sealing. Download the Technical Information for our Ultrasonic Products.